The Wallabies' scrum remains the laughing stock of the rugby world but some of the recent criticism may in fact be a little unfair, with Rugby World Cup-winning coach Bob Dwyer accusing England of illegal tactics at Twickenham. The hosts overcame a spirited Wallabies outfit 26-17 to confine Michael Cheika's side to a third straight loss to round out 2014, with England's powerhouse scrum securing a number of penalties to go with a try in each half of the nine-point win. Cheika later suggested his side would need to re-evaluate their scrum tactics and introduce more "wheeling", but Dwyer, whose 1991 Wallabies lifted the World Cup, preferred to take aim at England and, specifically, skipper Chris Robshaw. "England's scrummaging was totally against the written letter of the law," Dwyer said in an exclusive interview with ESPN. "I mean you're not allowed to have four players in the front-row - they forgot to mention that. He's [Robshaw] not the only bloke that's ever done that, I can remember way back in 1983 Argentina scrummaged that way. But Robshaw took it to a new level; he actually joined [Australia's] front-row. He not only joined his front-row but went past that and joined our front-row." 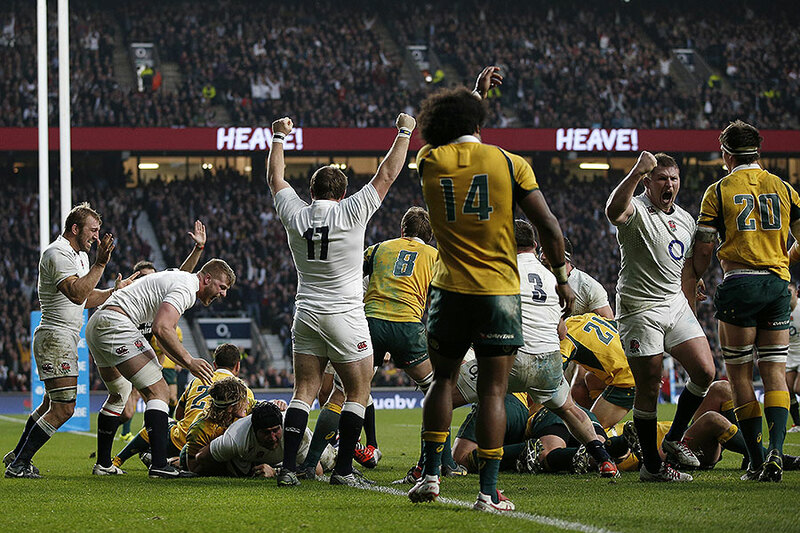 Robshaw's tactics were shown on replay but little has been made of their illegality largely because of the dominance of the England pack, and the long-running perception that Australia's scrum is among the weakest of the tier-one nations. While Dwyer was quick to lambast the England eight, he also paid tribute to their scrum and, in particular, their second try. "Now in having said all that about England, the scrum in which they scored the pushover try, it looked to me as though that was probably the scrum that was closest to the written letter of the law of the whole match," Dwyer said. "I thought they didn't do anything irregular or 'illegal' in that scrum; so that was just sheer scrummaging strength. Maybe they'd given our scrum so much of a workout by that stage that [Australia] didn't know where we were going. "So it's not only that you can vary your approach and go outside the law, it's straight scrummaging strength, tiredness and application as well. So [Australia] have to get better and we have to have a focused approach …we [Australia] we need to be quality scrummagers that can understand where pressure's coming from and understand to adjust; and indeed take advantage in some ways. So I think we were probably naïve and inexperienced in an across-the-board approach to scrummaging - particularly in front-row scrummaging." Cheika and his Wallabies staff have just nine months and four Tests to right Australia's scrummaging wrongs, with Wales and England both awaiting in the pool stage of Rugby World Cup 2015. It's not a great deal of time, but it may not even be an issue according to Dwyer - who believes there will be little chance of a uniform approach to scrum refereeing at the game's global showpiece. "I don't think there's any chance of having a consistent, accurate interpretation across the board," he said. "I think it's going to vary from referee to referee and game to game, and I think it's up to each scrum to be capable of adjusting their technique both in an attacking sense and a defensive sense. So I think it's up to us as individuals to sort that out." While the scrum remains a sore point for Australian rugby, Cheika's introduction has seemingly re-ignited a faltering Wallabies attack and brought about a change in team culture. Dwyer added his support to the Cheika reign, saying he'd already recognised a few key improvements. "I saw some very good things," he said. "On the previous spring tour a year ago, the Wallabies played very well. They didn't reach those heights this year but we did show some things that we hadn't showed for a long time. That was our No.9s and 10s getting second touches, which is a sign of a good attack; it's a good sign of good line of attack and accurate support play. "I thought also we showed a real ability to put large numbers into a small space and score tries; Nick Phipps' second try against Ireland was a perfect example. And not many teams can do that; New Zealand can certainly do it but not many other teams can do it. It requires straight running and a clear understanding of what you're [trying] to do to the defence, and it's very difficult to defend against a team that can attack that way. I haven't seen us do that for a long time; so I thought they were real positives."